Many of us can remember the thrill and the excitement we felt as a kid when we lost a tooth. Losing your teeth was a rite of passage, a sign you were growing older and wiser. Fast forward to the present and losing a tooth or multiple teeth has now lost its glorification. There is a lot to think about when you lose a tooth and how it should be replaced; having a consultation with Dr. Reese in Mountain Home, Arkansas can help you to decide the best method of treatment. To help answer any questions you may have before your consultation with Dr.Reese, we have compared two options: dental implants and complete or partial dentures (bridges). 1. 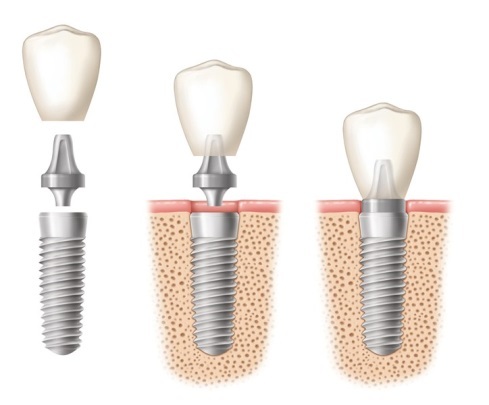 Dental implants can be used to replace a single tooth or multiple teeth with the help of artificial roots, typically made of titanium secured directly into the jawbone. Once the post has been surgically secured, your bone and gums will grow around the implant to hold it into place. After the post has been secured, a single false tooth, called a crown, can be screwed onto a single implant. Long	Lasting- Although there has been some debate on the longevity of	dental implants, it is believed that they will last on average,15	years, while some can last a lifetime if cared for properly. Natural	Function- Dental implants are the best option for having a natural	appearance. Dental implants also function as well as your natural	teeth, not prohibiting what you eat and how you brush or floss. Adhesive	Free- Dental implants do not require daily adhesive and soaking in a	cleanser. With the implant being secured directly into the jaw bone,	you will not face the situation of your tooth suddenly falling out	or slipping. Requires	Surgery- Dental implants will require surgery to secure the titanium	posts into your jawbone. This surgery is necessary to create a	natural look without the potential of further gum and jawbone	deterioration. to the intensive process and surgical procedures, you will see a	higher cost with dental implants. 2. Dentures are a removable option for tooth loss. 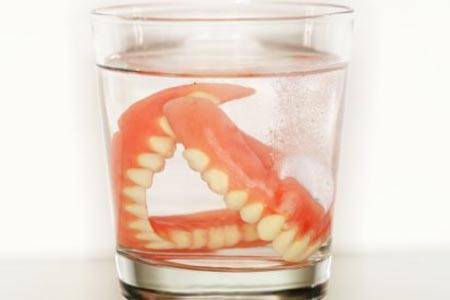 A full set of dentures can be used to replace missing teeth either on the upper or lower jaw, or both. If a full set is not needed, partial dentures may be used to fill in the gaps. The denture is comprised of materials recreated to appearas natural teeth supported by an acrylic base made to look like gums. Dentures can be held into place by dental implants or adhesives. No	Surgery Required- The word surgery can be rather intimidating for	some or simply not an option due to further health risks. Dentures	can be placed without any type of surgical procedure. 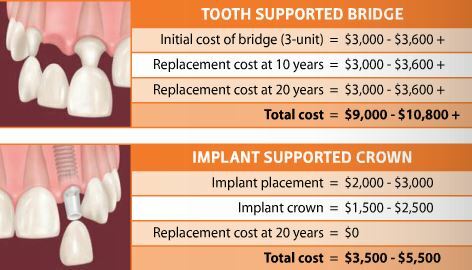 Affordable-	When a solution is needed without the fear of going into major	financial debt, dentures can be a more cost effective method in	tooth replacement. Adjustable-	Whether you have a full or partial set of dentures, they can be	removed or adjusted easily to fit your mouth over time. Extensive	Maintenance- Dentures must be cleaned properly and regularly to	prevent any further gum damage. With a bridge, or partial denture,	if not cleaned, plaque can build up creating a higher risk for	periodontal disease or additional tooth loss. Loss	of Natural Function- With dentures, certain foods will be prohibited	as the dentures may crack or become loose. As denture adhesive	loosens, you will become more vulnerable to impaired speech,	clicking noises, and tooth slippage. Whether you are in need of having a single tooth or multiple teeth replaced, now is the time to make your smile great again with the help of Dr.Paul Reese in Mountain Home, Arkansas. Call (870) 424-5900 to schedule your consultation today and see for yourself why Dr. Reese has been voted Best of Twin Lakes for five years in row! Dr. Reese will put you at ease while he personalizes the best plan of care to meet your needs.